You are here: Home / Galaxy Note 4 How-To Guides / How to customize Galaxy Note 4 ringtones? Choosing your own default ringtones, instead of the over the horizon that everyone else is using. Assigning different (customized) ringtones for individual contacts so that you know who is calling before picking up the phone. 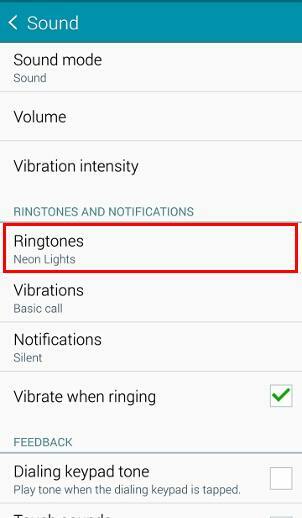 This guide will show you how to customize Galaxy Note 4 ringtones. If you want to customize Galaxy Note 4 notification tones, e.g., change Galaxy Note 4 notification tones, customize message notification tones for individual contacts, please check this guide. How to change default Galaxy Note 4 ringtone? 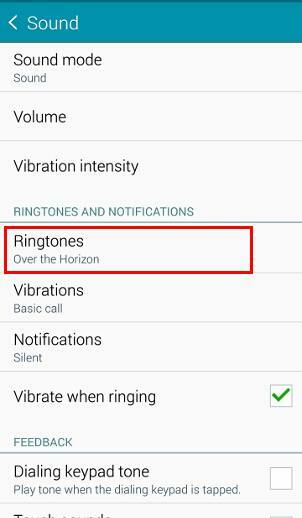 By default, Galaxy Note 4 uses the “over the horizon” as the default ringtone as many other Galaxy phones. So, when you hear the ringtone in public area, sometimes, you may notice several people are checking their phones. 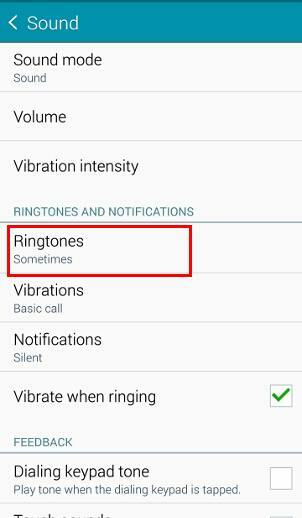 Changing the Galaxy Note 4 default ringtone is very simple. Go to Settings, tap Sound. Current default ringtone is shown under Ringtones. Tap Ringtones. The next window depends on apps you installed. 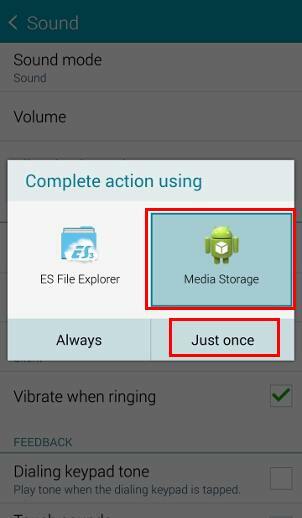 For example, if you installed ES File Explorer (here is a mini guide), you will have the option to choose ES File Explorer or Media Storage. 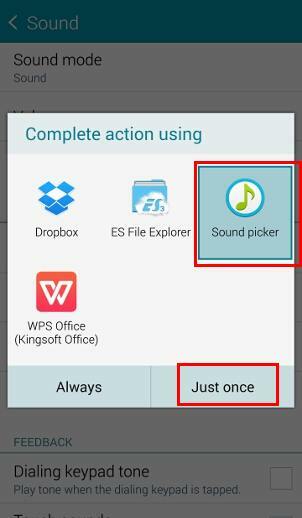 If you choose ES File explorer, you will be directed to select individual audio files, not the pre-installed ringtones. Media storage will bring you to pre-installed ringtones and all audio files you put in the Ringtones folder (see below). Tap Media Storage and tap Just once. If you didn’t install ES File explorer, you will get the next screen directly. 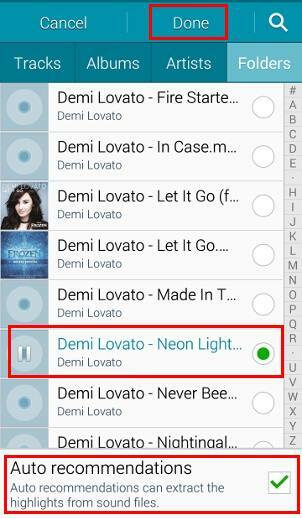 In the list page of available ringtones, you can select any of them. Then tap Done to apply the setting. How to use audio files on your PC as Galaxy Note 4 ringtones? If you don’t like the pre-installed ringtones or you want to customize Galaxy Note 4 ringtones, you can use your own audio files as ringtones. The simplest way to add your own ringtone files for Galaxy Note 4 is to copy these audio files directly into the Ringtones folder from a PC. Connect your Galaxy Note 4 to an USB port in the PC. You may need install Kies 3 if your PC fails to recognize your Galaxy Note 4. Once your Galaxy Note 4 is recognized, you can copy any audio files into the Ringtones folder on the phone storage. Sometimes, you may get a warning message on audio file format. Usually you can ignore it. Once the audio files are copied to the Ringtones folder, they are treated as pre-installed Galaxy Note 4 ringtones. 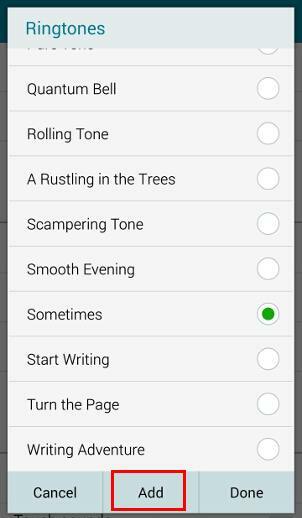 When selecting ringtones, they are listed together with the pre-installed ringtones. Select it as other pre-installed Galaxy Note 4 ringtones. Tap Done. 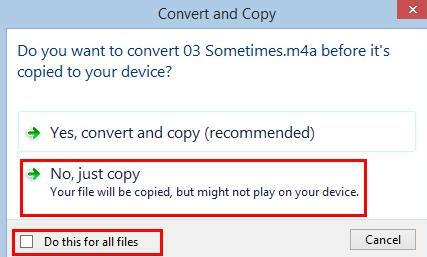 Now you should notice the default ringtone is changed to your audio file copied from the PC. 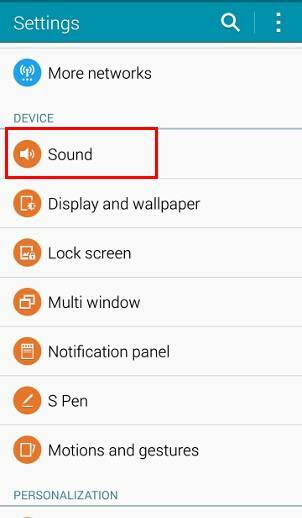 How to use audio file in the phone as Galaxy Note 4 ringtones? If the audio files you want to use to customize Galaxy Note 4 ringtones are already in the phone (either internal storage or SD card), you can use them directly as ringtones without copying them to the Ringtones folder. When in ringtone selection page, tap the “add” button in the bottom as shown below. Select the audio file. By default, Galaxy Note 4 will extract the highlight part of the audio file. You can turn it off if you want to play from the beginning. Then Tap Done to apply the new ringtone. Now you can check the new default ringtone on your Galaxy Note 4. How to assign different ringtone for individuals? Many Samsung Galaxy phone users are not aware that they can assign each contact different ringtones. This is very useful when you want to identify who is calling without looking at the phone or picking up the phone. Open Contacts app. Open the contact with whom you want to set a customized ringtone. Tap edit icon in the top as shown below. Current ringtone is shown. 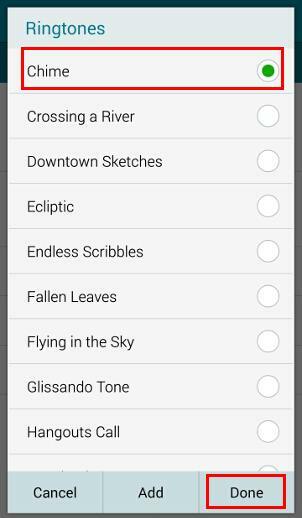 Select the ringtone from the list (which includes the pre-installed Galaxy Note 4 ringtones and all audio files in Ringtones folder) or choose “add” in the bottom (as shown above). Tap “Done” to apply the new customized ringtone for this individual. 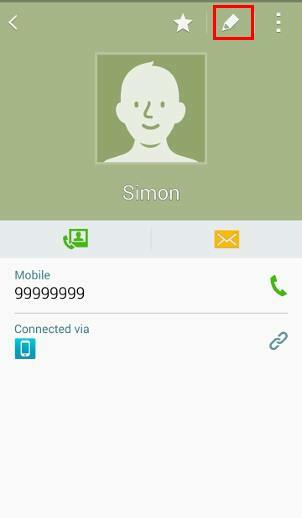 Now you should notice this contact is using non-default ringtone. Can you customize Galaxy Note 4 ringtones for the default and for individual contacts? If you have any questions to customize Galaxy Note 4 ringtones for the default or for individual contacts, please let us know them in the comment box below. We will try to help you find a solution. A few days ago, I went from a Note 3 to a Note 4. When making selections everywhere from which Sounds to which Browser choices, I have noticed the “Just Once” and “Always” buttons are missing everywhere I’m used to seeing them in the Note 3. And instead, by making a choice, I am creating a “Default” which is not always easy to remedy. I imagine, I can go into App Manager and change which Browser Gmail defaults to. But I cannot figure out how to change Sounds Folders. I fully understand how to switch from melody to melody and how to clear defaults within most Apps. What I cannot find is how to clear the Default that occurred while I was in System Settings > Sounds and Notifications > Ringtones. You can reset all default apps on Note 4 in Settings –Application manager– Menu key (3 vertical dots near the top right) –Reset app preferences. Hello, Today, when I went to change my ringtone, I was taken to one of my apps (Zedge), which in not normally the case. I am unable to access my other audio files where I normally select my ringtones from. I don’t see an option to revert back, search or choose from other than Zedge. Pls can you advise? Thank you! If you don’t use Zedge, you can uninstall it. I’m on Samsung Galaxy Note 4. When I have to do a HARD RESET on my Note 4 (which I do pretty often) all the ringtone assignments are lost. Is there any way for them to be saved anywhere? They’re obviously IN THE PHONE while the contacts are in Google. If they WOULD still be there if the ringtones were in place that doesn’t really help because the phone finds the contacts before I have a chance to copy the ringtones back into the wiped phone. Is there a service like Samsung or other that would backup the ringtone assignments? Because Google doesn’t do it. Ringtone is a ‘localized’ setting for contacts. Such settings are NOT synced with Google. I don’t think Samsung sync them either. When my Samsung Galaxy 4 is shut down/turned off/restarted most of my custom ringtones for individuals are reset to the default ringtone. Is there anyway to prevent this? I guess you are using your own music files. You should put them in ringtones folder in the internal storage. Don’t put them in SD card. I have a google number forwarding to my phone. Can I set a unique ringtone to the 2nd number? It depends on your carrier. When the call is forwarded, which number is shown on your phone, caller number or Google number? Can I change a ring tone to ring for a group? No, you cannot set group ringtone in Note 4/5 with the default contacts app in the phone. 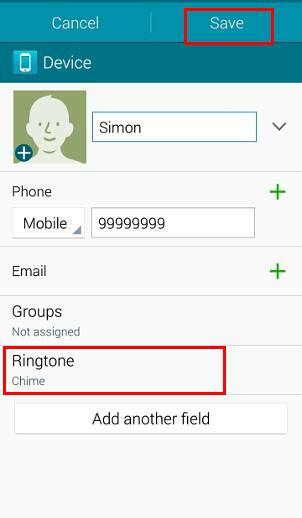 Do you happen to know of you can set a ring tone to an entire specified designated group? I’d prefer to not have to set the ring tone for each individually. NVM! I was able to figure it out! I loved my Gallaxy s4. Everything was simple, great features. I now have the Note 4, which I expected the same set up, just like my Galaxy tablet. Nope. Its a mess. Not intuitive, need an instruction booklet just to find out IF I can do something simple. Its terrible. Very unhappy Samsung customer! You can set message notification tone inside the message app so that it will different from the default system notification tone. Open Messages app, tap menu key, tap settings-notifications–notification tone. Oh hell i feel like an idiot now, went right by that before when i looked in my messages setting. Thanks! Very likely, the contact is saved in sim card. Sim card can only store name and one number. You should copy it to phone storage and then you can get all options. I have individual ringtones set for multiple people but it only ever plays my preset generic ringtone. Any idea how to get around this? Did you check the ringtone in the contacts app? When the phone rings, is the caller identified correctly? I don’t think there are any workarounds for this. My phone was never recognized after installing Kies 3. Never could get it recognized so I could transfer songs to the phone from the pc. I installed Kies 3 on phone & on pc. I need help. Just want songs transferred to my Samsung Note 4. You can re-install Kies 3. Sometimes, even if Kies does not recognize your Galaxy Note 4, your PC recognizes it already. You can check it in the Windows explorer. You cna then copy files from the PC to the phone directly without through Kies. You should also check your Galaxy Note 4. You should get a notification about the USB connection. Having problems with editing saved numbers at all, I think it’s because contacts are only saved to Sim, how do I save all contacts to phone? SIM card can only store name and one number for each contact due to the limited storage in SIM card. In Settings–Application settings– contacts –import/export contacts. You can choose import from SIM card. When creating a new contact, it is best to create under your Google account so that Google can sync all contacts among all devices automatically. 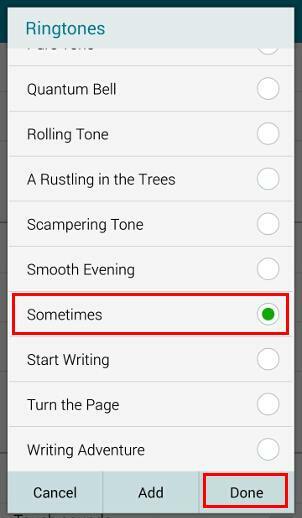 How can I change my text alert ringtone? it’s notification tone under settings -sound. you can customize it like ringtone. if you want to put file files directly onto the phone, you can put it under notification folder instead of ringtone folder in the phone. Hi, I was wondering if it is possible to set a call tone on the note 4 (a specific song that others will hear while waiting for an answer)? The connecting tone can only be set by your phone company, not from note 4. And in most regions, it’s not free. You may check with your phone company. I don’t think they allow your own music. They may only allow you choose one from their list. I have been trying to get tones onto my phone for over a week…. very annoying. However I couldn’t get either of the ES File downloads to work, they just churned and churned. I finally found a lovely way to move the files over to ringtones using the Add button under settings/sounds/ringtones/chose media/add/soundpicker or cloud or onedrive or zredge and it took me to my local files. No extra apps!! Actually, this was covered in this guide. how do I stop a ringtone (30 sec) from playing twice when I use it as the alarm ringtone? I think this is the purpose of Alarm. You need take the action: snooze or dismiss. I tried to pick my mp3 as my ringtone but when i touched on ‘Add’, the Sound Picker did not appear…any idea why? You can just copy the mp3 file or ogg file in the ringtones folder directly with My Files. Question ..my S3 gave me the option to set a ringtone for individuals ..and yet set a ringtone for notifications. I can’t seem to figure it out on my note 4. Can anyone help? For each contact, you can add one field of message tone. Then set notification tones for it. I just got the galaxy note 4 and i was wondering if there was a site to download ringtones on? I had the galaxy 3 and i would use myxer but for some reason im not showing it the playstore. Any help would be appreciated. There are many websites and apps for it. Please avoid the ringtone apps that controls your ringtone. They may mess up your phone. Try to buy then download to the phone. In other words, just get the audio file. Actually, most audio files can be used as ringtones. 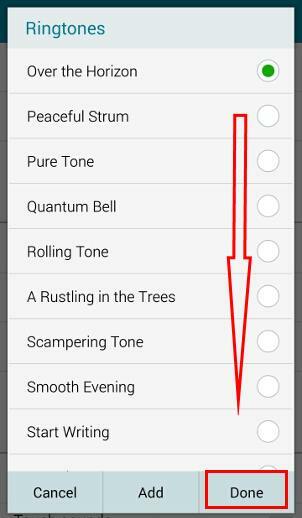 I am trying to make individual ringtones and followed your directions above but for some reason, I am not getting the “ringtone” option to choose a ringtone. In other words there is no default ringtone showing in the edit contact menu. Can you direct me to the solution? You can try to copy it to phone storage, then try again. You may also test this function by creating a new contact on the phone. Is it just my phone or do all the ringtones for the Note 4 start off soft then increase in volume? When I play them in settings the ringtones are loud, however when someone actually calls they start soft then increasingly get louder. I miss text message alerts because of this. I also noticed that when Im using the Google Maps navigation the volume of the navigation sometimes gets soft then loud again. Have you experienced this? Is there a way around this? For ringtones, it depends on regions. In old hardwares, Samsung allows you to enable or disable ascending ringtones. But Since S5, the option is removed. For media ans apps, the volume settings are independent. You can set them in Settings–Sound–Volume. Some apps may have their own volume settings. Thank you! You understood enough to send me where I needed to go. I needed to be looking in the settings of the Messages app, not the base phone settings. Is there a way to customize the Message notification tone? On my Note II I was able to pick a tone and make it replay at a select interval. I Loved that feature. Is it MIA from the Note 4? I didn’t get what exactly you want to achieve. Anyway, for each contact, you can set different message tones in the contacts app. If you want to repeat the notification, you can set it in the messages app. Tap the menu key (3 vertical dots) – settings – notifications – repeat message alert. The music which I am using as my ringtone are missing from my play list. Any idea on how to rectify this? The pre-installed ringtones should NOT appear in the list. If you at talking about a music file that you put in the ringtones folder, you can use My Files app to make a copy to other folders, then it should appear in your list. Alternatively, you can choose music based on folders and choose the file to the playlist. Does anyone know how to use a custom notification audio file instead of what is on the list? It will not let me select anything but what is pre loaded. Thanks! Similar to ringtones, just put the audio file in the Notifications folder. I want only a certain part of a song as ring tone and not from beginning. But I can’t find the option to crop the song. There are only two options, from the beginning or let the app decide. You can trim the mp3 file on pc or with some apps. There are many free tools for this. Hi, unfortunately, no.. even worse a week ago all of my email information on my old phone including contact info was wiped off.. luckily I had it al saved to the cloud. I don’t see anything called storage in the details of the contacts either.. It is so weird tat groups and ringtone is not on the page for me.. very frustrating..
What are the fields shown for individual contact? You may try to visit local Samsung service centre. When they see the problem, they should know the cause. Hi i am having same prob but my contacts saved to sim. How do i fix? When you save the contacts, there is an option to choose the saving location (on the top, below cancel and save button). If you want to import contracts saved on the sim card to the phone. You can tap the menu icon (3 vertical dots in the contacts app), tap settings – contacts- import / export. Can I customizer the ringtone for an individual without changing the WhatsApp sound notification? The phone now changes all messages and WhatsApp and calls to the assigned ringtone!! In WhatsApp, tap the menu key – settings – notifications, you can uncheck contact ringtone.